Recently, one of my colleagues came into my office and talked to me about his recent experience of doing his first 5K with his son. He loved doing it, and I loved hearing about it. 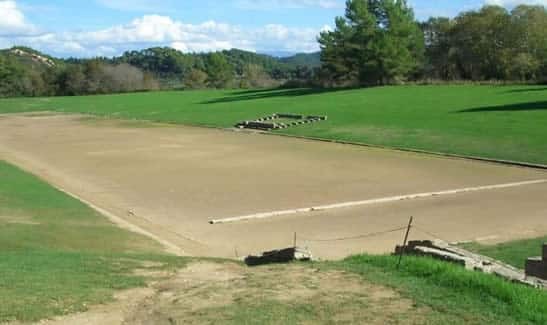 As we talked about running and racing, he told me that years ago, he had taken a trip to Greece and that one of the places they visited was the original Olympic stadium–which still includes the original running track. Because…well…it’s a 2,000-year-old track from the first Olympic games. As a runner, does it get more awesome than that? No. No, I don’t think it does. I think the second entry on the list will be to run the Athens Marathon (which is the one that runs that road, beeteedubs). After the way Haruki Murakami talks about running that course in What I Talk About When I Talk About Running, the idea of running in Greece seemed very spiritual to me, anyway. And now that Bill told me about being able to run on the Olympia racetrack…I’m sold. A lot of runners have their wishlists of races they want to run by the time they retire from the sport. I had never really thought about that until recently. I’m a runner, not necessarily a racer. I just love the experience of running. Which is why I think starting my Running Bucket List with a Greece twofer is a good way to go. Who knows if I’ll ever make it, but I’m sure going to try. What race or location tops your Running Bucket List? Oh, I had no idea there was a Great Wall one! One of my students a few years ago told me she was from a village not far from the Great Wall, and they took it for granted that it was there and rarely paid any attention to it. It’s like I always hear about New Yorkers and all the touristy things there, too. I had just never even considered the Great Wall of China to be that way! I hear so much about races that involve wine, and it’s so far out of my experience. Here in the South, I don’t really see that at all. Occasional beer races, but that’s about it. Ok yea, that sounds pretty dang awesome. I don’t have any running bucket list items, but I do want to visit Arthur Ashe stadium and attend a U.S. Open one of these days! I had no idea that the track with still intact! That is seriously so awesome and even more amazing that he got to run on it! Definitely adding it to my bucket list as well. I was the same way! When he told me that, I was totally in shock. Who knew they still let people run on it, and that it was even still there? Crazytalk! Athens is on my bucket list too! (Along with about 500 other marathons! I think I may have to run well into my 90’s to complete them all, lol!) I found you through #wowlinkup. I’m glad to find another runner who geeks out about the same things I do! Ooh Greece, I’ve always wanted to visit but to run where the first Olympic marathon took place…wow…I’d be full of chills! I’d love to run throughout Europe! He didn’t mention if he had pictures, and I kind of doubt it because he had no idea about running on it before they got there. But even still…that memory would be astonishing on its own. What a great bucket list. My running bucket list is the Disney Coast to Coast Challenge. I’ve run at Disney World, but not at Disneyland. I just want to do any of the RunDisney stuff. I about lost my mind this year when I saw there were Star Wars-themed races and medals. But I couldn’t make it out to them. Hopefully next year or the next I can at least hit one Disney one. Running/racing in Greece has been on my list forever! It would be such an amazing experience and trip! Yes! The trip itself would be awesome, and the running just icing on the cake. Running in Greece and just visiting Greece would be awesome! A friend of mine went a couple of summers ago and videoed her run – it looked super cool and I too am very jealous! Oh, I would love to see that video! I am so jealous!